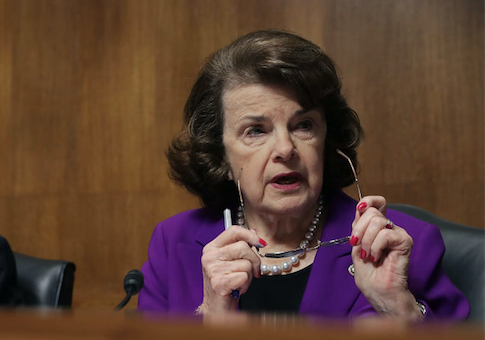 The San Francisco Chronicle editorial board took Sen. Dianne Feinstein (D., Calif.) to task for her handling of a sexual assault allegation against Supreme Court nominee Brett Kavanaugh, saying she took the "worst possible course." "Sen. Dianne Feinstein's treatment of a more than 3-decade-old sexual assault allegation against Supreme Court nominee Brett Kavanaugh was unfair all around," the board wrote on Sunday. "It was unfair to Kavanaugh, unfair to his accuser, and unfair to Feinstein's colleagues—Democrats and Republicans alike—on the Senate Judiciary Committee." "Feinstein, a California Democrat, took the worst possible course by waiting until almost a week after Kavanaugh's confirmation hearing was completed to ominously announce that she had turned over ‘information from an individual' about Kavanaugh to the FBI, and adding that she would be honoring the woman's ‘strongly requested' confidentiality," the editorial continued. California professor Christine Blasey Ford wrote Feinstein in July that Kavanaugh drunkenly attacked and groped her when they were teenagers at a house party in Maryland. She requested to remain anonymous. Feinstein did nothing with the information until after Kavanaugh's confirmation hearing concluded, when she released a vague statement last week about having "received information from an individual concerning the nomination of Brett Kavanaugh to the Supreme Court" and that she had referred the matter to authorities. The sordid details of the story quickly leaked out, and Ford came forward to reveal herself as the accuser, saying she feared her story would get twisted. Kavanaugh has flatly denied the accusation, as has a friend, Mark Judge, who Ford said witnessed the assault. Feinstein did a "disservice to her Judiciary Committee colleagues" by concealing the charge she received in July, the Chronicle wrote. Feinstein did not mention the charge in her questioning of Kavanaugh during public hearings or in her one-on-one meeting with him. A fair case could be made, the board wrote, that a sexual assault from even 35 years ago could be enough to disqualify Kavanaugh, but it hit Feinstein for muddying the waters with political maneuvering. "The regrettable outcome here is that the Senate Judiciary Committee never had a chance to contemplate those difficult questions or consider the merits of this accusation while they were holding hearings on the nomination," the board wrote.